If you happen to be in Helsinki on Monday 18th - 21st January 2010 come by and watch MobiLenin live in action, painting buildings of Helsinki university. The media art event celebrates the new era for the university and its 370-year history. Find more info from this blog: Mobispraying HU. 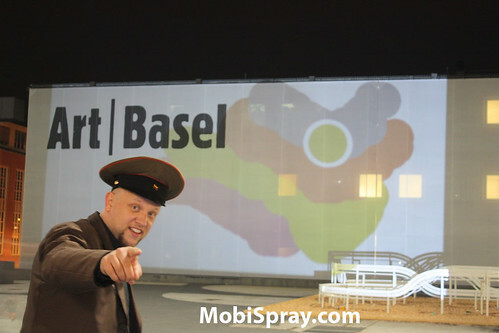 MobiSpray was this year shown at Art Basel - but not in the traditional way as all the other artworks were, no, I hi-jacked the event and put it up in guerilla manner, in the MobiLenin style. Check out some of my trophies below. I’ll put up a video a bit later. I found the Art Basel this year highly inspiring and really worth visiting. I met many interesting people and had good talks. 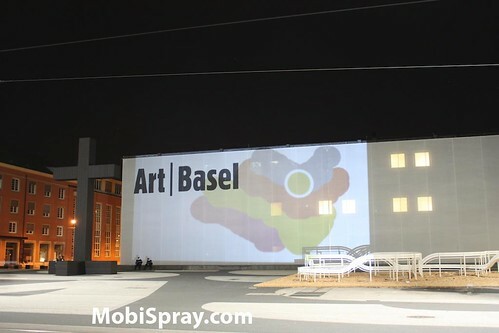 Spraying outdoors on the huge frontside of the Art Basel Exhibition main hall. Yes, it was done by me. Every evening I painted the citiy of Basel in some location that I was tempted to change into the looks as I want it. Here, I painted at the Marktplatz. This is in some quater in the city centre somewhere. I love it to be able to make my environment look as I want it to be. It is liberating. Because of this I started to embrace the cities and places I go these days much more than I ever did. It is fascinating to be able to change the looks of my reality. I feel the world is giving me a lot - it inspires me, heavily. 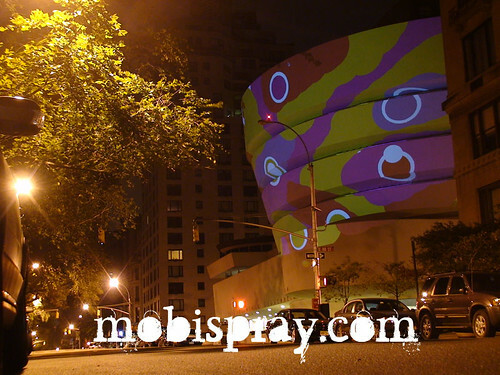 And I want to turn this inspirational energy into something new, unexpected, kicking - my MobiSpray paintings. During the last few weeks I had the chance to travel to New York, Melbourne, Sydney, London and Vancouver. And to give you a quick overview of my creations in various places, I put up here a few collages up. Enjoy! From left upper corner: Vancouver: Siwash rock Stanley park, Science world,Waterfront buildings, Canada place, At gallery, London Smartphone show party. From left upper corner: Sydney Potts point neighborhood, Federation Square Melbourne, Sydney Opera House, London Big Ben, Parliament house, Tate Modern museum London. 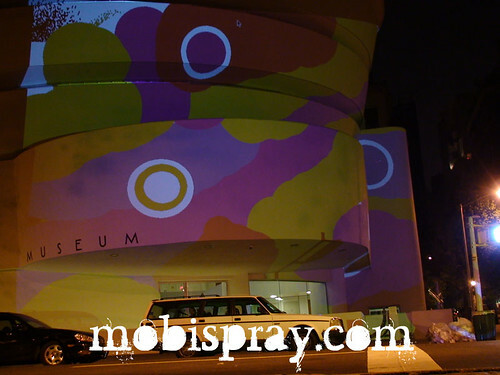 The best ever mobispraying that I did so far was the Guggenheim museum in New york. It had the right size, is purly white and is completely dark at night. But above all it has such a fascinating shape that it makes you wanna mobispray forever. Find more photos on Flickr here. I believe one day I will need to go back to paint Guggenheim again, because it is real fascination to do it. When I was in Taiwan in August to teach there, I had to visit the world famaous UFO houses at Sanjhih, north of Taipei - since it was closeby where we stayed - in ‘uncle Lee’s house’. 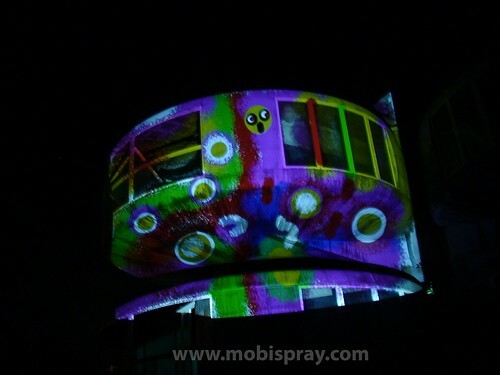 My greatest wish was to MobiSpray on the UFO houses, and so I did or lets say we did. I invited a few friends from the MIT Media Lab with whom I stayed with in Taiwan to come with me. And we had an extraordinary experience. When we entered the site the wind was blowing strangely and strong, but also the grass made loud noises caused by the wind. 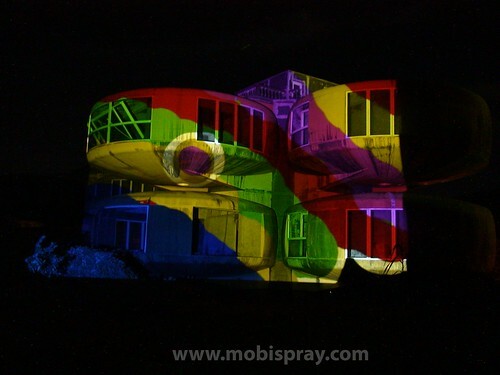 And of course it was dark, since it was night as we wanted to use MobiSpray to make some UFO houses look as we wanted them to be. For one of our Taiwanese fellow girl it become too eerie after a short time, so she left. 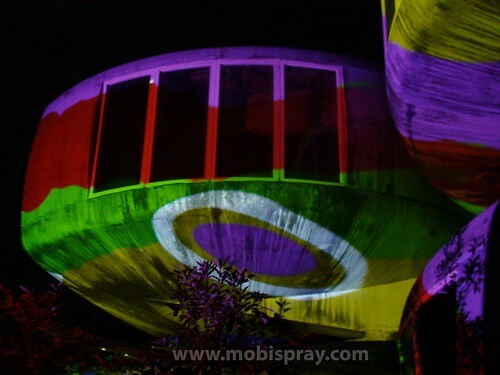 The rest of us set up the gear and we started spraying - and it was totally exiting to mobispray on this weirdly, but nicely designed UFO houses. 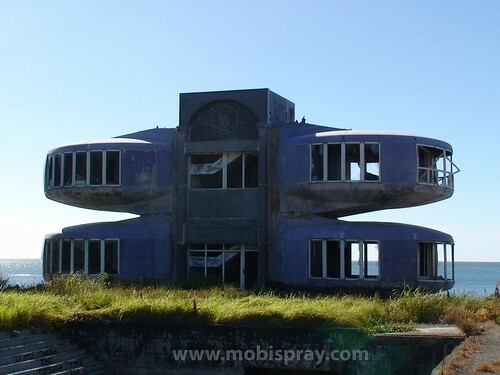 I learned originally about the UFO houses a few days before leaving to Taiwan through an article in the German online magazin Spiegel: http://einestages.spiegel.de. Title of the article was ‘Die Geisterstadt der Außerirdischen’ meaning the ghost city of the aliens. 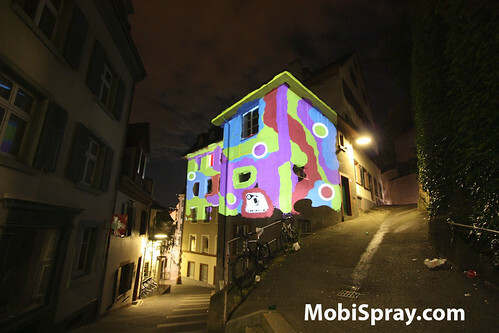 And of course the shape of the UFO-houses was something I had to try out as canvas for MobiSpray. Find more photos at Flickr here. 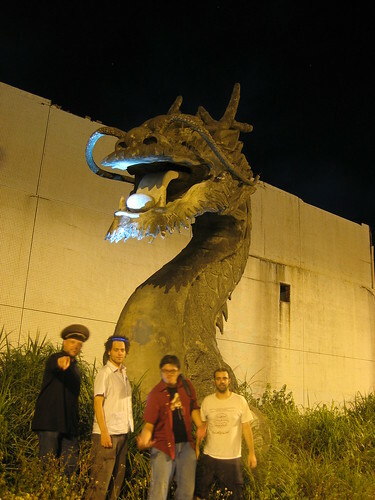 When I was teaching at the nightmarket workshop 2008 in Tainan, Taiwan during August 2008, which was organized by my friend Jackie Lee, I mobisprayed together with my Taiwanese students. 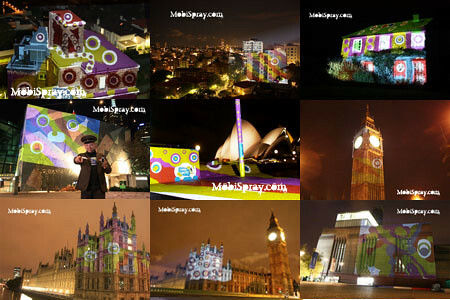 And this occasion has opened my eyes for new uses of MobiSpray: You can make something to look beautiful that is normally perceived as ugly or not worth looking at. 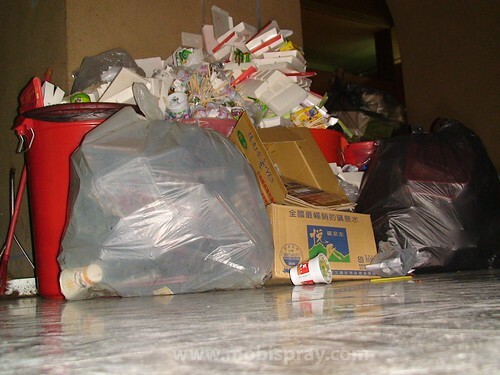 We were spraying on trash that was lying in the hallway of the workshop building. 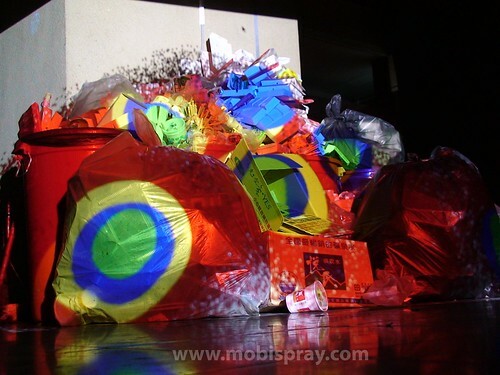 After we went through a fantastic spraying session in shich my students were spraying, too some of them said: ‘For me, the trash has become my treasure!’. 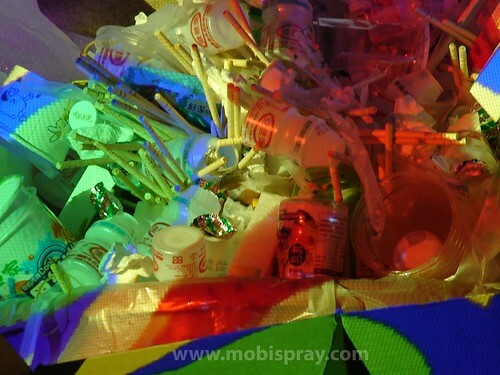 A comment that hits a point of what Mobispray can do.